Det är semestertider och jag har varit hemmabunden på grund av något slags elakartad halsinfektion, så jag har passat på att avverka ett par spel ur den väldigt stora högen jag impulsköpt på Steam när det varit rea. Normalt växer spelkön fortare än jag hinner spela, så att ta två spel på en helg kändes bra – särskilt som båda två visade sig vara sådana jag kan rekommendera till andra. Recensionerna är ursprungligen skrivna för att publiceras på Steam, så de är på engelska. Där presenteras recensionen också tillsammans med lite bakgrundsinfo om själva spelet, så jag börjar här med att sammanfatta varje spel kortfattat på svenska och ger ett sammanfattande betyg mellan 1-10. 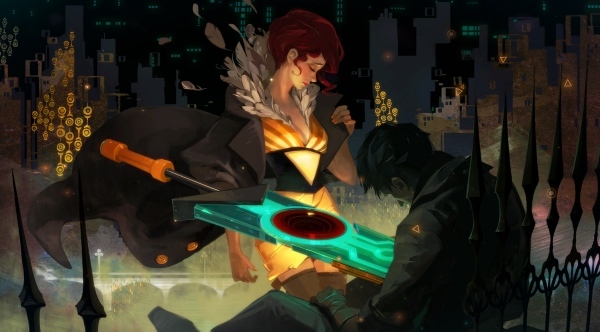 Transistor är ett actionrollspel (tänk Diablo) med sci-fi-tema och kraftiga influenser av koncept och terminologi från programmering. Spelarens karaktär är “Red” och hon, liksom alla andra karaktärer i spelet, existerar som ett slags abstrakta avatarer i en värld där både personligheter och den fysiska verkligheten kan definieras om, nätverkas och programmeras som i något slags mer eller mindre utopisk cyberpunk-framtid. När spelet börjar har Reds pojkvän precis blivit dödad och hans personlighet överförd till ett svärd, Transistor. Samtidigt håller hela staden på att förvandlas till ett grått intet på grund av ett virus. Med svärdet i hand söker Red hämnd för sin pojkvän och att fixa det som hotar upplösa verkligheten. This game is artistically perfect, well worth playing for the story, art and soundtrack alone. I also enjoyed the innovative combat system. Being able to combine any attack with any other and being rewarded for it is excellent design and encourages you to continuously change your playstyle. Being able to plan your moves in advance means it’s not just about quick reflexes. This kept combat from becoming repetitive, like hack’n’slashers usually do, in the 8 hrs it took me to complete the main story. I’m likely to go back and do the rerun to explore the additional combos I didn’t unlock. Reading some of the negative reviews it’s clear many of them simply didn’t understand how to play the game, so perhaps a better/longer introduction would have been useful. You do pretty much crash into things without a clue at first, but I picked it up having read a few reviews first that explained the gameplay. And the lack of early, long-winded exposition is good, too – the reading you have to do to get all the details of the story are very evenly spread out with the action. If I were to point out a negative, the “tests” felt kind of redundant and weren’t very fun although I felt compelled to do them in order to gain extra levels. In the end it wasn’t necessary. I only did about five tests, never used more than one limiter and still only died twice in my first playthrough. So the game wasn’t very challenging for me. Not a problem though as I was playing for the story first and foremost. 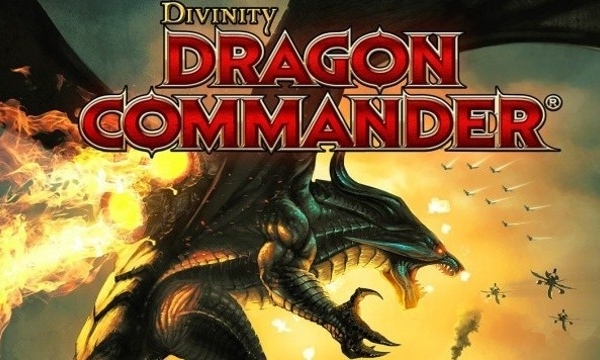 Divinity: Dragon Commander är ett strategispel som kombinerar element av realtids- och turbaserad strategi. Större delen av spelet utspelas på en strategisk översiktskarta där dina enheter repesenteras av spelpjäser som du kan flytta mellan olika länder (som i RISK). När du kommer i konflikt med en motspelare så kan du välja att själv delta i striden, som då utspelas som ett konventionellt RTS, med symmetriska sidor och enkel resurshantering. Du kan också själv delta i striden genom att förvandla dig till en eldsprutande drake, vilket är effektivt mot fiendens enheter men ger dig sämre kontroll över dina egna. Mellan striderna kan du också ägna dig åt politik för att de olika raser som bebor ditt imperium ska komma överens och ge stöd åt din sida i kriget, som går ut på att ta över hela den kända världen. A very nice effort from Larian which would have been even better if they’d just spent a bit more time on making the parts fit together. I love the blend of RTS/TBS with dragon combat and political chat’em’up. The RTS segments feel like a dumbed-down version of Supreme Commander – it looks like whoever has the most units wins at first, but it’s entirely possible to beat terrible odds using clever tactics and some units (Juggernauts) are massively overpowered, which lets you exploit the mechanics to great effect. Dragon combat is satisfying without being so effective as to completely dominate every battle. Unfortunately the AI is prone to abusing the cheap spellcaster units and there is no effective counter. I had to auto-resolve some battles where my army was superior on paper, because I could not win otherwise. This brings me to the greatest single weakness of the game – the way battles are resolved on the strategy map. You can only personally manage one battle per turn, which is fair – that’s what your generals are for. But then, despite having four of them, you can only use one per turn. Are the rest of them drunk at the bar, or what? Furthermore, the effect of using a general is paying a flat fee for a slightly increased chance-to-win, nothing else. They don’t gain levels, their dialogue doesn’t change and there’s no risk of them dying if they fail. Essentially, all four generals could have been replaced, strategy-wise, with a once-per-turn bonus of 10-20%. A terrible waste of an otherwise very promising feature. This would not have been so bad if auto-resolve (when neither you nor a general is available) was anywhere close to realistic, but it doesn’t take the actual map or unit composition into consideration at all. Units with NO anti-air capability will have a non-zero chance of defeating flyers, ships may greatly influence the outcome of auto-resolve whereas the actual map is laid out so that you can’t use ships offensively. In effect, auto-resolve ends up being used when you have no choice because you’re out of battles for that turn, or to get out of having to deal with broken mechanics (like mass spellcasters). Continuing with the strategy part of the game, I love the board game setup with the cards to make things a bit more unpredictable, but it’s unfortunately *much* too easy. Playing on Normal (I shudder to think what Casual mode is like!) I was easily able to build up such a strong economy in chapter two that by the finale, I was maxed out on research and could simply buy enough units to steamroll the enemy throughout. The AI never attacks you where you don’t expect and will often willfully engage in battles it has <10% chance of winning, wasting units. It must sound like I’m not recommending this game but I actually greatly enjoyed most of the RTS battles, the population mechanic (where you can only build so many units in a match) and the fixed building sites make for more dynamic and fast-paced gameplay than most RTS:es, turtling it out in your base is simply not an option although it may be a viable short-term strategy. The maps are well-designed and the visuals are good. Nice bright colors make your units stand out in the detailed terrain, and when zooming out the units are represented by simple icons (another thing that is brilliant, and reminds me of SupCom). Adding to the enjoyment is the part in-between battles, where you manage the politics of your empire. The dialogues are humorous, the characters quirky and interesting – it’s always a treat to find out what they’re going to suggest. Weighing your personal views against what would be the most strategically sound decision for your empire makes for a different type of challenge – I am sure many players will already have a principled stand on an issue like women’s rights, but what do you do when giving both sexes the same pay will put a significant strain on your war economy? For the record, I ended up playing liberal/capitalist, meaning I sided with the elves and dwarves most of the time, made the feminists happy-ish and I still ended up with approval over 75% with everyone. So there you go. You’ll notice I’ve spent almost none of this review talking about the story. That’s because there really isn’t one. You will see bits of one in barely-animated cutscenes and you can listen to some dreary exposition from Maxos the Wizard if you so desire, but it’s laid on paper-thin and has nothing to do with gameplay. In fact – it seems to have been written completely separate from the game itself! At one point, Maxos tells you in horror that the powerful demon he had been using to power your flagship has broken free. Yet the ship is still running just fine and the demon’s still down there, business as usual! Another time, you’re asked whether you want to start allowing women to serve in your army. But at that point you already have TWO female generals and some of your combat vehicles are very obviously piloted by women! Best to simply ignore the story completely unless you want to be bothered by contradictions. In summary, I recommend this game if you are in the mood for heaps of casual RTS action with a sprinkle of very enjoyable dragon combat and some political intrigue to keep things interesting. If you prefer your RTS complex and your story deep, look elsewhere. For the 17 hours it took me to play through, I consider my money well spent.